Only CGSE members that have been approved to trade on electronic trading platform for the RMB contract. Sunday – Friday 6:00pm – 5:15pm with a 45-minute break each day beginning at 5:15pm. The Hong Kong gold market is one of the most active physical gold trading markets in the world, and plays host to the traditional Chinese Gold and Silver Exchange as well as being a hub for a large number of investment bank precious metals trading desks. Gold trading activity in Hong Kong helps set the tone for gold markets further west later in the day, and the market has been to some extent a price setter along with London and New York, and not just a price taker. Hong Kong’s close links to China, and the recent collaborations between the Shanghai Gold Exchange and the Chinese Gold and Silver Exchange, have further increased the importance of the gold market in the Hong Kong Special Administrative Region (SAR). 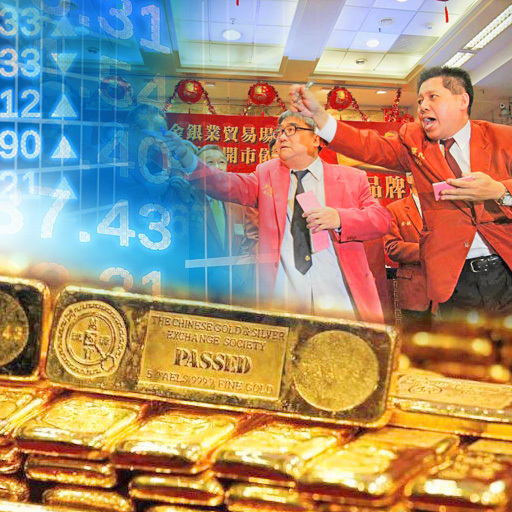 The CME Group has also targeted Hong Kong with the 2015 launch of a one kilo gold futures contract which is physically deliverable in Hong Kong, while Hong Kong Exchange and Clearing (HKEx) is planning the launch of a Yuan-denominated gold futures contract. Much of the gold being transported into the Chinese mainland from Europe and elsewhere had been routed via Hong Kong, particularly in 2013. This has changed somewhat since 2014 when China began to import more gold directly, however, Hong Kong is still recording sizable gold imports, and re-exports. The Chinese Gold and Silver Exchange (CGSE), founded in 1910, is Hong Kong’s only physical gold and silver exchange, and is run by the CGSE members as a society, hence the name Chinese Gold and Silver Exchange Society. The Exchange is now operated through a subsidiary company called ‘Hong Kong Precious Metals Exchange Limited’ which was established in 1994. CGSE Member companies hold unlisted shares in ‘Hong Kong Precious Metals Exchange Limited’. The CGSE has over 170 members, nearly exclusively local company members. Oversight and supervision of the Exchange is provided by member representatives who are elected to executive and supervision committees every 2 years. Six gold contracts trade on the CGSE, four of these on the Exchange’s electronic trading platform, the other two via traditional open outcry in the Exchange’s trading hall. The CGSE electronic trading platform was launched in 2008. The open outcry system trades a 99 Tael Gold contract and a 9999 Hong Kong Dollar denominated Kilobar Gold contract. The 99 Tael gold contract is the Exchange’s traditional traded product. The HKD Kilobar contract was launched in 2002. The CGSE’s electronic trading platform trades a Hong Kong Dollar 999.9 Tael Gold contract, a Chinese Renminbi Kilobar Gold Contract (the world’s only RMB gold contract outside mainland China), a 100 ounce Loco London Gold contract, and a 10 ounce Loco London Gold contract. The Renminbi kilobar gold contract was launched in October 2011. The 999.9 Tael gold contract was listed in February 2013. Trading in the 100oz and 10oz loco London USD denominated contracts began in March 2008 when the CGSE launched its electronic platform. In Hong Kong, a Tael, or Tael Troy, is a traditional Chinese precious metal weight measurement equal to 37.429 grams or 1.20337 troy ounces. A 5 Tael gold bar therefore weighs 6.01685 troy ounces (approximately 6 ounces). A tael troy can be subdivided into 10 mace troy and 100 candareen troy. Although the definition of Tael varies within Asia, the specifications for the Hong Kong tael troy are documented in Hong Kong legislation within an ordinance addressing weights and measures dated 30 June 1997, which was the eve of the handover of Hong Kong from the UK to China on 1 July 1997. From 1949, Hong Kong regulations had required that only gold bar transactions of fineness less than 950 fine were legally permissible. This led to price quotations of 945 fine gold on the CGSE, however most trading still remained in the traditional 99 fine Tael bars. In 1970, the CGSE officially amended the fineness for official standard traded gold from 945 fine to 99 fine so as to more accurately meet the requirements of the jewellery industry, and to reflect the prevalent trading of 99 Tael bars. Gold contracts traded on the CGSE are for same day delivery, but the Exchange offers a contract deferment option which allows CGSE contracts to display characteristics of both spot and forward delivery, and so CGSE contracts can trade spot basis or on a forward basis, like a futures contract. If contract delivery is not deferred, the contract trades spot for immediate delivery between the contracting parties. However, delivery of contracts can also be deferred in which case the trading parties agree to pay/receive a premium or carrying charge. If a seller wants to defer delivery, the seller pays a carrying charge to the buyer, and vice versa. Contracts can be deferred indefinitely and then closed out, and so are analogous to an undated futures contracts. Carrying charges (for unclosed contracts) are determined on the Exchange at 10:30am for 999.9 Tael gold, 11:00am for 99 tael gold, and 11:15am for HKD Kilo Gold. Trading hours on the floor of the CGSE are Monday to Friday from 9am to midday, and from 2pm until 5pm. Open outcry deals are settled via the submission of contract notes to the CGSE settlement department, which updates member positions within its settlement system. The CGSE informs relevant banks of the settlement transactions. Members of the CGSE organise physical delivery of the gold that they trade on the Exchange, and the Exchange is not involved in delivery. However, the Exchange oversees an accredited delivery system. A special category of CGSE member known as a ‘Bullion Group’ members are permitted to manufacture small gold bars for the Hong Kong market in the form of 999 fine 1 Kilogram bars and 99 fine 5 Tael bars. These bars are classified as Hong Kong ‘Good Delivery’ bars. There are approximately 30 ‘Bullion Group’ members in the CGSE Society. The CGSE also fully owns and operates the ‘Hong Kong Precious Metals Assay Centre’. The only bars deliverable for the 99 Tael gold contract, the 9999 Tael gold contract, and the HKD Kilo gold contract are bars manufactured by CGSE-accredited refineries (see below for list of CGSE-accredited refineries). For the Renminbi Kilobar gold contract, acceptable delivery bars are 9999 fine kilobars manufactured by CGSE accredited refineries, or 9999 fine or 9995 fine kilobars accredited by the Shanghai Gold Exchange. CGSE Five Tael bars that are produced by the CGSE accredited refineries are stamped with both the stamp of the refinery and the stamp of the CGSE. The full list of CGSE members can be viewed on the CGSE website. This list highlights the venues (open outcry / electronic) and gold/silver products that each member is authorised to trade. Many of the CGSE members are also members of the “Hong Kong Precious Metal Traders Association” (in Chinese 香港貴金屬同業協會有限公司). Wing Fung is a diversified bullion-focused group of companies which was established more than 30 year ago in Hong Kong. It began as a precious metals bullion wholesaler but now includes bullion dealing, a gold refinery, futures dealing and online gold trading. Wing Fung trades all CGSE gold contracts and is a liquidity provider for the CGSE’s electronically traded loco London 100oz (LLG) contract, and 999.9 Tael gold (LTG) contract. The Wing Fung refinery produces CGSE accredited and ‘WF’ branded 99 Five Tael gold bars, 999.9 Five Tael bars, and 999.9 One Kilo bars. Wing Fung states that it ranks in the top 3 in the Hong Kong market for physical precious metals transaction volume. A selection of Wing Fung gold bars can be viewed on its website. Wong Cha Company Ltd is a CGSE bullion group member that trades all CGSE gold contracts. Wong Cha is a liquidity provider for both the CGSE’s RMB Kilo gold and HKD 999.9 Tael gold contracts, and it provides an online trading platform. The Wong Cha refinery produces CGSE accredited 99 Five Tael gold bars, 999.9 Five Tael bars, and 999.9 One Kilo bars for the jewellery industry. Wong Sha’s website is listed under associate company Henfin. Marigold International Bullion Dealers is a bullion group member of the CGSE and is authorised to trade all CGSE gold contracts. Marigold’s refinery produces CGSE accredited 99 Five Tael gold bars and 999.9 One Kilo gold bars. Marigold received its CGSE license in 2008 after acquiring a former member of the Exchange. First Asia Merchants Bullion (First Gold) was established in 1991 and is licensed to trade all CGSE gold contracts. Its refinery is CGSE accredited for the production of 999.9 Five Tael and 999.9 One Kilo gold bars. A number of large and prominent Hong Kong gold jewellery companies are also CGSE members, such as Chow Tai Fook Jewellery Company Ltd, Luk Fook Bullion Dealers Ltd (part of the Luk Fook jewellery group), King Fook Gold & Jewellery Company Limited , and Chow Sang Sang (through Chow Sang Sang Bullion Dealers Ltd. Chow Sang Sang also runs a bullion wholesaler subsidiary called World Commercial Sales Ltd. In July 2015, the CGSE and the Shanghai Gold Exchange (SGE) launched the “Shanghai-Hong Kong Gold Connect”. The ‘Connect’ refers to exchange connectivity and cooperation between the CGSE and the SGE, and also extends to a CGSE trading room and precious metals vault in Qianhai in Shenzhen. Shenzhen is a city in the People’s Republic of China (PRC), about one hour’s drive from Hong Kong. The gold ‘Connect’ initiative intends to integrate the Chinese ‘onshore’ and ‘offshore’ gold markets, as well as to boost Renminbi (RMB) gold pricing power on the SGE while furthering the PRC’s strategy of internationalising the Renminbi. CGSE has joined the Shanghai Gold Exchange (SGE) as a special international member. The trading systems of the two exchanges (CGSE and SGE) have been linked together. More than 170 members of the CGSE members are now permitted to trade gold on both the Main Board and International Board of the SGE using offshore Renminbi. CGSE has also opened a gold trading platform and logistics operation in the Chinese Qianhai district of the Shenzhen free-trade zone, which includes a precious metals vault and assay centre. The CGSE estimates that its members will trade up to 100 tonnes of gold per annum on the SGE. In theory, this will boost trading volumes and liquidity on the International Board of the SGE, (i.e. the SGEI), improve pricing power of the SGE, and will therefore increase the importance of RMB denominated gold pricing. If successful, the Chinese gold sector will also become more integrated to Hong Kong, since Chinese mainland customers of the CGSE can trade the CGSE contracts priced in HKD and USD. The Shanghai-Hong Kong Gold Connect is modelled on the “Shanghai – Hong Kong Stock Connect” which was an earlier initiative between the Hong Kong and Shanghai stock markets that has sought to improve access and trading liquidity between the two stock markets, and the connectivity between Chinese A and H shares. Chinese A shares are listed shares of mainland Chinese companies that trade in Renminbi. H shares are Hong Long listings of dual-listed Chinese mainland stocks that trade in Hong Kong dollars. The CGSE has opened a base in a free-trade zone (FTZ) in Qianhai, in Shenzhen. The CGSE refers to this operation as its “Qianhai Precious Metals Logistics Assay Centre“. About 70 per cent of China’s gold jewellery is manufactured in Shenzhen. The full CGSE operation in Qianhai is still being built and the vault will be complete in the first half of 2017. When complete, the complex will have offices, a trading area, a precious metals vault (bonded warehouse) with a capacity of 1500 tonnes of gold, and a precious metals assay centre. Currently, CGSE is using temporary offices and a temporary vault in a building at the China Vanke Enterprise Dream Park in Qianhai. Approximately 70 of CGSE’s 171 members are now trading out of Qianhai. Although it is in a free trade zone, the gold brought into Qianhai by the CGSE members still needs to be imported by one of the 15 Chinese banks approved to import gold into China. The new ‘Connect’ approach improves logistical efficiencies since the CGSE members (gold traders) can now deliver gold to customers in Shenzhen and Shanghai, although gold will still technically have to be exported from the Shenzhen FTZ to the Chinese mainland. Previously, Hong Kong gold traders had to transport gold from Hong Kong to jewellery factories in Shenzhen. The Shanghai International Gold Exchange has appointed Bank of China (Hong Kong) Limited (BOCHK) as its sole settlement bank for the funding and payments processing for cross-border gold trading transactions on the Gold Connect. BOCHK is a clearing bank for RMB in Hong Kong. In November 2015, the CGSE announced that it had been in discussion with Singapore Exchange (SGX) about launching a Singapore – Hong Kong Gold Connect based on a similar model to the Shanghai – Hong Kong Gold Connect. This would allow CGSE members with a Hong Kong Securities and Futures Commission (SFC) license to become remote trading members of the SGX and trade the SGX Gold Kilo contract. This SGX contract has seen very low trading volume since its launch in October 2014, so the Connect would be a way for SGX to potentially increase participation in the contract, and would also facilitate CGSE member access to the Singapore gold market. In March 2015, the CME Group launched a US dollar denominated Gold Kilo futures contract (ticker GCK) which is physically deliverable at approved precious metal vaults in Hong Kong. The futures contract’s price quotation is for US dollars per troy ounce for delivery of a 1 kilo gold bar of 9999 fineness. Although the contract is pitched as a ‘Hong Kong’ gold futures contract, it trades on the CME’s electronic Globex platform and clears through the CME’s clearing platform Clearport. 12-month period. Delivery day is the 3rd Wednesday of the contract delivery month, as specified on the CME website. On-exchange trading volume for the GCK contract is relatively low, ranging from approximately 200 to 600 contracts per trading day, and open interest is minimal. The CME Gold Kilo futures contract can be traded on the CME Globex trading platform (i.e. on exchange), but it can also be traded bilaterally off-exchange (OTC), with the trades then sent to CME’s Clearport for clearing. In January 2015, the CME announced a market-maker program for its COMEX gold kilo futures contract which authorised up to 10 market maker participants who “must quote continuous two-sided markets… at predetermined average bid/ask spreads and minimum quote sizes”. In April 2015, the CME raised the allowable number for the program to 12 market makers. Similar to the CME daily warehouse gold inventory report for the COMEX approved vault facilities in New York and surrounding areas, CME also publishes a daily warehouse gold inventory report for the three Hong Kong approved vaults. For a discussion of eligible vs registered gold and warehouse warrants, please see the relevant topics under the ‘US Gold Market‘. Malca-Amit’s vault facility in Hong Kong, opened in 2012, is located beside Hong Kong International Airport at units G30-31, Airport Freight Forward Centre, Check Lap Kok. The Loomis vault is at unit 701, Global Gateway, 168 Yeung Uk Road in Tsuen Wan. Brinks’ vaulting facilities are in the ATL Logistics Centre, located at the Kwai Chung Container Terminal in Kwai Chung. The HKIA vault at Hong Kong International Airport, run by HKIA Precious Metals Depository and owned by the Hong Kong Airport Authority, also submitted an application for approval by the CME as a designated vault facility for CME’s Hong Kong gold kilobar contract. This application was submitted in December 2014, at the same time as Brinks and Malca Amit applications, but then HKIA withdrew its application again in June 2015. Later in June 2015, the CME approved Loomis Hong Kong as an approved depository for the it’s gold kilo contract. Hong Kong based gold futures products are not a new phenomenon. In August 1980, a US dollar denominated 100oz gold futures contract representing 995 fine gold was launched for trading on the floor of the Hong Kong Commodity Exchange. This contract was deliverable against gold held in approved London vaults [See “Gold: A World Survey” Rae Weston, 1983, published by Crook Helm]. Hong Kong Commodity Exchange subsequently changed its name to Hong Kong Futures Exchange Ltd (HKFE) in May 1985. The HKFE then suspended its gold future contract in the 1990s due to low trading volumes. In March 2000, Hong Kong Futures Exchange Limited (HKFE), the Stock Exchange of Hong Kong Limited (SEHK), and Hong Kong Securities Clearing Company Limited (HKSCC) all merged together to create Hong Kong Exchanges and Clearing Ltd (HKEx). In October 2008, HKFE launched a cash-settled gold futures contract. This HKFE gold futures traded on the HKATS derivatives platform and cleared through the HKFE Clearing Corporation Ltd with Wing Fung Futures Ltd acting as a market maker. These gold futures represented a US dollar quotation for 100oz of 995 fine gold, based on loco London delivery. The contract’s settlement price used the London Gold Fixing morning benchmark. This contract was itself suspended by HKEx on 13 March 2015 due to lack of trading volume. This de-listing also coincided with the replacement of the London Gold Fixing with the LBMA Gold Price benchmark, so it appears that it was felt there was no point in amending the contract specification for a product that did not trade. At the time, HKEx stated that it would review the redesign of its gold futures contracts products. In December 2015, BullionDesk reported that HKEx plans a new Hong Kong based 99.99 kilobar gold contract denominated in Renminbi, which would be deliverable in Hong Kong vaults. In February 2016, Bloomberg reported that HKEx CEO Charles Li said that “a yuan-denominated gold contract is also in the works”. Note that HKEx acquired the London Metal Exchange (LME) in December 2012, and that even though the LME is predominantly a base metals exchange, it too is planning to list gold futures contracts. The SPDR Gold Trust (GLD), which is primarily listed in New York on NYSE Arca, also has a secondary listing denominated in HK Dollars on the Hong Kong Stock Exchange (HKEx) under ticker 2840. GLD is sponsored by World Gold Trust Services, which is a fully owned subsidiary of the World Gold Council (WGC). The WGC also maintains a regional office in Hong Kong. In 1939, Hong Kong, then under British administration, joined the Sterling Area, one of the dominant currency areas of the time. The Sterling Area’s foreign exchange controls included severe restrictions on the import and export of gold to and from Hong Kong. This led to the evolution of a convoluted pattern of Hong Kong gold imports being routed indirectly via neighbouring Macau. In January 1974, the Hong Kong Government lifted these gold import and export restrictions, leading to an influx of Western banks locating to Hong Kong to trade gold in the Hong Kong market. These banks included NM Rothschild, Mocatta & Goldsmid, Johnson Matthey, Credit Suisse, Union bank of Switzerland (UBS), Swiss Banking Corp (SBC), Dresdner Bank, Deutsche Bank, and Republic National Bank[See “The New World of Gold“, Timothy Green, 1985, published by Weiden and Nicolson]. Nowadays, most of the large investment banks/bullion banks continue to maintain commodity and gold trading operations in Hong Kong. These banks include HSBC, Standard Chartered, Australia New Zealand Banking Corp (ANZ), Deutsche Bank, Scotia Mocatta, UBS, Credit Suisse, Goldman Sachs, Mitsui, Commerzbank, Natixis and Macquarie. As well as physical business, the bullion banks in Hong Kong arbitrage between the local and international gold price. In addition to HSBC, other large Hong Kong / Chinese banks are also involved in gold trading in the Hong Kong financial district such as OCBC Wing Hang Bank, ICBC, Bank of China (Hong Kong), and Hang Seng Bank. In Hong Kong, Hang Seng Bank quotes buy and sell gold prices for 99 Tael, 999.9 Tael, and offer a gold passbook unallocated gold savings product. OCBC Wing Hang Bank offers gold bar, ingot and coins purchase and sale services in Wing Hang branches in Hong Kong, and gold passbook accounts. The CGSE has accredited 13 refineries in Hong Kong as approved refineries for its various deliverable gold contracts. All of these refineries are locally owned, except for Heraeus Hong Kong. Most of the approved refiners are accredited to produce the 99 Taels Gold bar and the 999.9 One Kilo bar, and a smaller subset of the refineries are accredited to produce the 999.9 Five Taels bar. The Bank for International Settlements (BIS) has an Asian region representative office in Hong Kong and runs a gold trading desk from the BIS Hong Kong office. The London Bullion Market Association (LBMA) held it’s annual Precious Metals Conference Hong Kong in November 2012, the presentation slides of which can be viewed on its website. ‘Precious Metals Insights’, a consultancy active in the precious metals space, is based in Hong Kong . The World Gold Council maintains an office in Hong Kong at Level 19, Two International Finance Centre . After over 100 years, the CGSE is still at the heart of the local Hong Kong gold market, and continues to innovate, launching new contracts (RMB), forming new alliances (SGE connect collaboration) and building new infrastructure (Quinhai platform and vault). In various ways, these CGSE initiatives all underscore the increasing dominance of the Chinese gold market and the progressive internationalisation of the Chinese Renminbi. Likewise, China benefits from harnessing the infrastructure and know/how of the CGSE membership base. The larger Hong Kong gold market of the local operations of the international bullion banks, the vaults and transport providers, and the futures exchanges have also all benefited from Hong Kong’s strategic position as a gateway to China and the SAR’s use by China as a gold trade entrepôt. As the Chinese gold market moves into its next phase of evolution and internationalisation, Hong Kong is in pole position to share in this journey.